The traditional Sunflower usually grown in children's’ competitions. Sow Spring/Summer, direct into 10-15cm pots or direct-sow seeds outside when all danger of frost has passed sow to a depth of 1/4 inch. 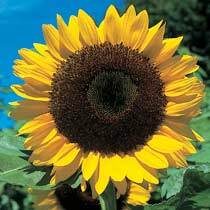 Sunflowers have Rapid growth, so requires feeding with each watering.